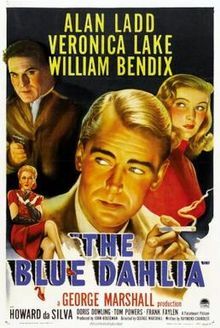 The Blue Dahlia (1946) is a story of betrayal. Alan Ladd is a returning war vet in this film noir who arrives in Los Angeles fresh off the bus with his two war buddies, played by Hugh Beaumont and William Bendix. Ladd is the hero of the piece, if one can term the chief protagonist of a film noir a hero, but his pals are as important to rounding out his character and even driving the plot. This is our entry in the Classic Movie Blog Association blogathon: Femme/Homme Fatales of Film Noir. Ladd is not so much an homme fatale in this film as would be, say, Howard Da Silva, who plays a charming and venial nightclub owner, because Da Silva is the only person in the film with the mystique, not just the brutish quality, of evil. Ladd is more a victim who plods his way blindly through a web of betrayal until by the end of the movie, we really don’t see him as much a hero as just the last man standing. But the studio banked on his mystique when paired with Veronica Lake, who is not so much a femme fatale here as another survivor on a dark journey, though perhaps better equipped by nature for survival. The three war buddies part company early in the film and we are not given the indication that they will see much of each other in postwar life, though Hugh Beaumont and William Bendix will be joined at the hip because Bendix has suffered a serious head wound which has left him fresh out of the VA hospital with headaches, confusion, and memory loss. Hugh Beaumont, the steadier, responsible, quiet member of the group has taken it upon himself to take charge of Bendix and be his keeper. It is a thankless job as any caretaker can tell you, and just why he feels a sense of responsibility towards Bendix we are never told but it is probably the only example of self-sacrifice in a movie that is so rife with betrayal. The only other example of altruism is perhaps found in the character played by Veronica Lake, who meets Alan Ladd when he is in trouble. 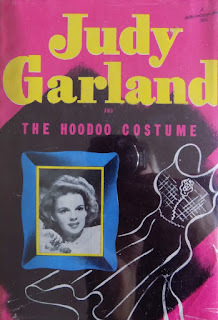 She is, we assume, attracted to him but keeps at a levelheaded distance partly because she is still entangled with a mobster husband and partly because Alan Ladd wants it that way. It is a kind of sacrifice. Later, she will confront Howard Da Silva, her mobster husband from whom she is estranged, for Ladd’s sake. The movie begins on a truly, inexplicably sad note. The Three Amigos enter the postwar world with a sense of apprehension. 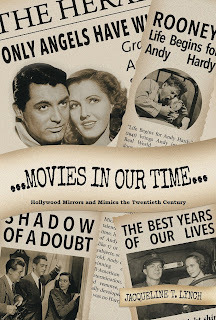 This was common to veterans; we see this in other movies including The Best Years of Our Lives (1946), which we've covered in several blog posts, and Till the End of Time (1946), which we will cover some time, but these fellows do not articulate the reasons for their sense of doom. Hugh Beaumont has a reason to feel glum, perhaps he foresees a rough road of responsibility for William Bendix and his medical troubles and is stealing himself for a life as his guardian. Bendix, with a hair-trigger temper to boot, is tough to manage. Of the three former Navy flyers, he alone continues to wear his bomber jacket. The other men are dressed in suits they somehow managed to find in the postwar clothing shortage. When they park themselves at a bar for a parting drink, Bendix remarks to Ladd, "Lucky stiff, at least you've got a wife to come home to." And we see Hugh Beaumont try to discreetly shut him up, something Beaumont will have to do several times during this movie. There is some secret we don’t know. Alan Ladd says only "Here's to what was." And when they part, Hugh Beaumont, apparently the watchman for all of them (no wonder he became Beaver’s dad), asks Ladd, "Don't you think you ought to call her before you go home?" Alan Ladd remarks with a mysterious, defeated smile, "Maybe." It is a foreshadowing that Alan Ladd's home life is not all that it should be. We have a great deal of foreshadowing this movie, it is like bread crumbs scattered in the forest and it helps us to keep our trail, it helps us to find our way. It is a writer's device to point to whom he wants us to trust and not to trust. There are no red herrings here or tricks, but it will take you until the end of the movie to find out who the real murderer is. There are several plausible witnesses because there is just so much betrayal. 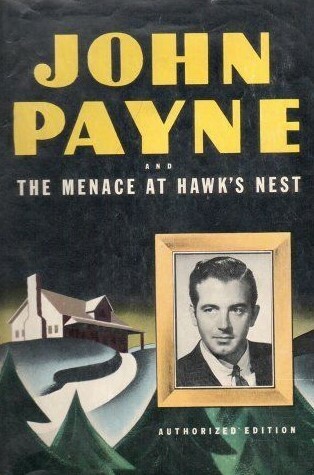 The writer is Raymond Chandler, which is as fine a pedigree a film noir movie could get. Alan Ladd goes to his wife's home, a swank hotel and bungalow complex that seems perhaps a bit more than his allotment checks could have paid for and he stumbles upon a late afternoon cocktail party in her apartment. The alcohol is flowing, someone is playing “Accentuate the Positive” on a piano and people are dressed to the nines, people with dubious integrity, seemingly without a care in the postwar world. We receive more telegraphing of clues when Alan Ladd goes to the desk clerk and asks for his wife's apartment and we see the bellhops and the desk clerk exchange arch expressions as if they did not know that his wife was married and we may assume that she has been carrying on with others. Alan Ladd knows nothing of this and walks into the party. His wife, played by Doris Dowling in her fourth film, is completely surprised, prickly, jittery, not knowing how to welcome him, especially when she has her lover in the apartment, Howard Da Silva. Da Silva is as smooth and articulate a bad guy as ever graced a film noir. He runs a local nightclub called the Blue Dahlia and his calling card is to present guests and lady loves with massive arrangements of the large blue flowers. When Alan Ladd from behind a door sees his wife with her arms around Da Silva, kissing him, Ladd interrupts and slaps Da Silva across the mouth. Da Silva graciously backs down and leaves. We will later discover, as he discusses with his partner in his club, that he is perfectly willing to let Alan Ladd's wife return to her husband because he is tired of her. It’s easy to get tired of the demanding, constantly angry, constantly drinking Doris Dowling. She taunts Alan Ladd for striking Howard Da Silva, "You’re a hero. A hero can get away with anything." There is an inference of self-entitlement which would still go against the grain of the newly postwar country. Ladd, who plays scenes with a great deal of control and an appropriate sense of weariness, retreats to the bedroom where he has only just begun to unpack and he sees two photos in a double frame. One is his service photo and on the other is a portrait of their deceased son, Dickie. Dickie died while still a baby. He contemplates the photo; she had never sent him one. 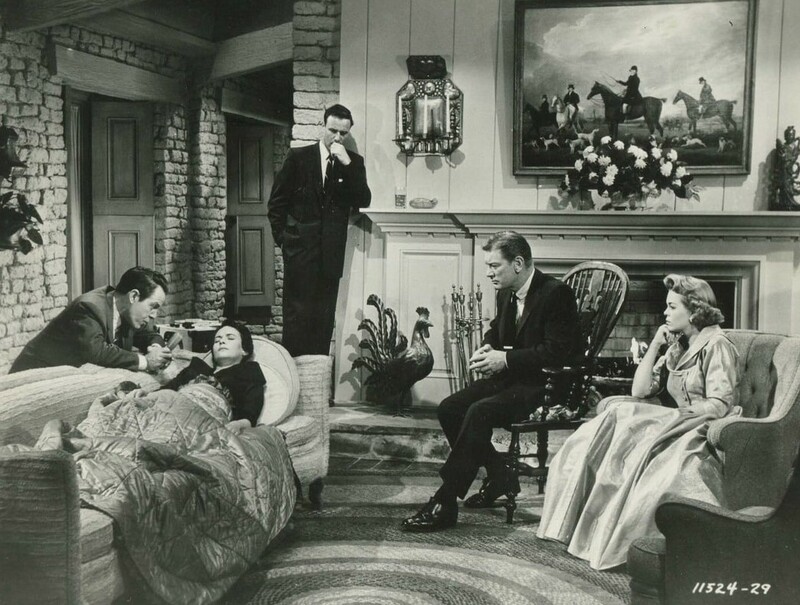 When the guests leave, hustled out, they are alone and Ladd tries to get her to put down her drink, which seems to be attached her hand, so that they can talk. Her fit of temper returns and she announces in a flippant manner that she is her own woman, that she can do what she wants and see who she wants. He becomes angry and she replies I could tell you something that would hurt you plenty. She regrets immediately saying it but he presses her and in another fit of temper she confesses that their son did not die of diphtheria as she had written to him but that he was killed in a car crash. She had brought the baby to a party because she did not want to stay home; she was drunk and wrecked the car and Dickie died. Ladd needs no more info. He takes the photos and prepares to leave her for good, but for one moment he pulls out his service revolver and she thinks he's going to kill her but he says that she is not worth it and he tosses it to the couch and he leaves in the pouring film noir Los Angeles rain. The story is told with a great deal of cutting back and forth between different characters and action occurring simultaneously that is fast-paced and this is what makes the movie successful. There are only so many ways you can tell a story, even something as complicated and intriguing as a murder mystery, but for film noir it is not so much the story but how stylistically it is told that makes the genre unique and memorable. We have a reference to the postwar housing shortage when Bendix phones and relates that he and Beaumont scored an apartment ahead of nineteen other guys because it is Beaumont’s old apartment and the landlady liked him. See? Having good manners and being responsible pays off. Doris Dowling will later phone Bendix at their new flat and confess Ladd has walked out on her. Why this bothers her is unknown, as she seemed pretty well through with Ladd, but Bendix, who is emotional and impulsive, leaves in the rain and shows up at her swank hotel and bungalow complex to talk with her, and waits in the bar. She is there, but neither knows who the other is or that they had just spoken to each other on the phone, and we have the beginnings of a pickup. The rain continues to pound down, and during the evening, Bendix, as well as Da Silva will show up at Dowling’s apartment. The house detective played by Will Wright is always lurking around, spying on the action, so we know what he knows. It is more foreshadowing, for when a murder has been committed, we see there are several suspects, but the only thing we're sure of is that it wasn't Alan Llad because when he left, she was still alive. William Bendix eventually returns home to the apartment he shares with Hugh Beaumont, soaked to the skin from the rain, dazed, clearly troubled and doesn't remember much of what he's done in the past couple of hours. Meanwhile Alan Ladd hitchhikes and gets picked up by Veronica Lake. We get a little bit of foreshadowing about Veronica Lake, too. 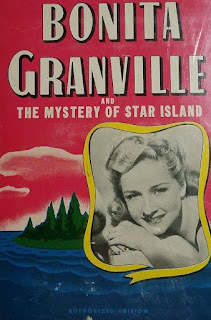 Her portrait is at Howard Da Silva's nightclub and we are told that the they split up not because of a woman but because she didn't like his shady dealings, and Da Silva’s the partner confesses that she's evidently a wonderful woman and both agree that she is far too good for Howard Da Silva. So by the time we meet Veronica Lake we are already disposed to understand she is no gun moll. 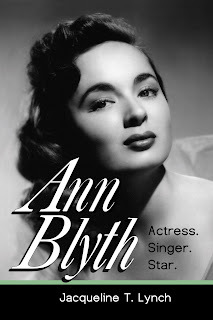 She is true blue and maybe this is the first bit of good luck Alan Ladd runs across. However, there is no romance. They say goodbye, they meet again, they say goodbye, and both discover separately that the police are after Ladd for murder. The movie is successful at keeping us off balance and what is going to happen and who was going to end up with who. We only know for sure that Alan Ladd is not a murderer and that Veronica Lake is a nice person. As Hugh Beaumont says of him, "Whatever's the right thing to do, Johnny'll do it." Alan Ladd's journey through this movie is pretty much based on how other people react to him. His wife does not want a life with him. 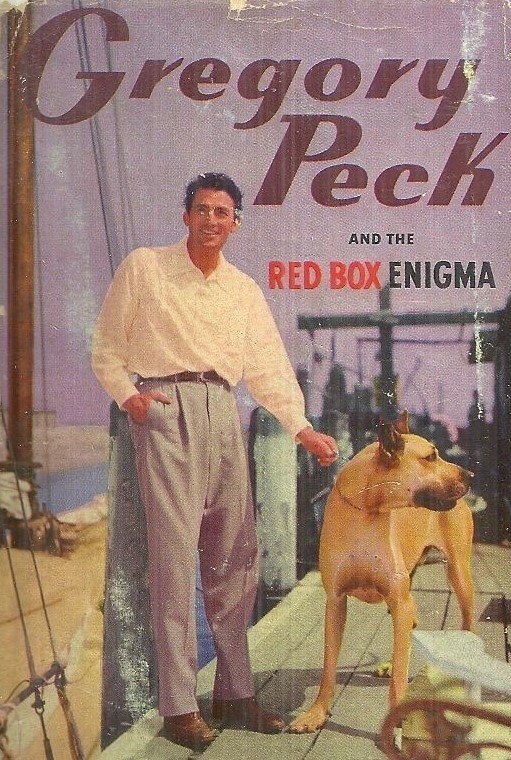 When he discovers is wanted by the police, he runs into a couple of petty thieves who take him to a flophouse to hide out for a fee and they stab him in the back as does the fellow who runs the flophouse played by Howard Freeman. Freeman betrays Ladd by going through his belongings and asks for shakedown money to hide him from the cops. 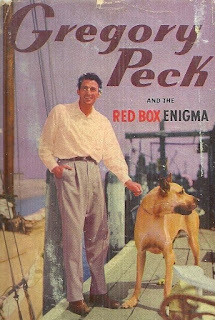 Will Wright keeps coming back and he shakes down everybody he can: Howard Da Silva, William Bendix and Hugh Beaumont. Everybody betrays everybody: When Howard Da Silva's partner and another thug kidnap Alan Ladd, beat him up and take him to a cabin in the woods, the bad guys betray each other. Interestingly, Doris Dowling provides an ironic bit of wifely fealty by writing on the back of the portrait of their baby some secret info about Howard Da Silva (betraying her lover posthumously, quite a parlor trick). Alan Ladd has seen enough by half of the movie that when he runs into Veronica Lake again, he confesses his suspicion of her and how "your timing’s good." She tells him "you'll have to trust me." But, of course, he can't he can't trust anybody, not in this movie. Alan Ladd, in one sense, is even betrayed by his old buddies. He goes to their apartment and they want to hide him. Bendix wants to take it on the lam with Ladd, and Beaumont, who was an attorney before the war, suggests turning himself in. Alan Ladd is shocked to realize both his buddies think he actually did commit murder. He is angered by that sense of betrayal. How could they know him so well and yet think he would stoop to murder?! The loose ends come together when the police captain, played by Tom Powers, interrogates all and sundry at Da Silva’s office in his night club. Bendix recalls the events he had forgotten on the rainy night of his blackout, and now he thinks he’s the murderer. Will Wright is suspected because he was always lurking around, he had opportunity – though motive is never made clear to us. At the movie’s beginning, Mr. Wright takes a role similar to many he held over his long career – a cantankerous and possibly shifty coot, but as the movie progresses, we see it is the role of a lifetime for him. He is treated as over the hill and past his prime by the cops and others, a has-been from the word go, but we are told he is 57 years old and for those of us in that neighborhood, it is a bit stinging to think that could have been seen as over the hill, especially since he looks much older. In real life, Mr. Wright was actually 52 years old at the time. Ouch. Alan Ladd returns, performs an irrelevant party trick to clear William Bendix from the charge of murder, and we realize the cops have already cleared Ladd and found their man. I’ll give you a break for once and not spoil it, but it’s hardly a shock. We're not sure what's going to happen with Alan Ladd and Veronica Lake. They meet warily one last time by her convertible waiting to say goodbye again (check out the B gasoline ration sticker and our previous post on the subject here), and the only signpost we are given that it might not be goodbye permanently this time is because William Bendix and Hugh Beaumont, who are waiting for him, give up and walk away to the nearest bar. Alan Ladd may or may not catch up with them later. 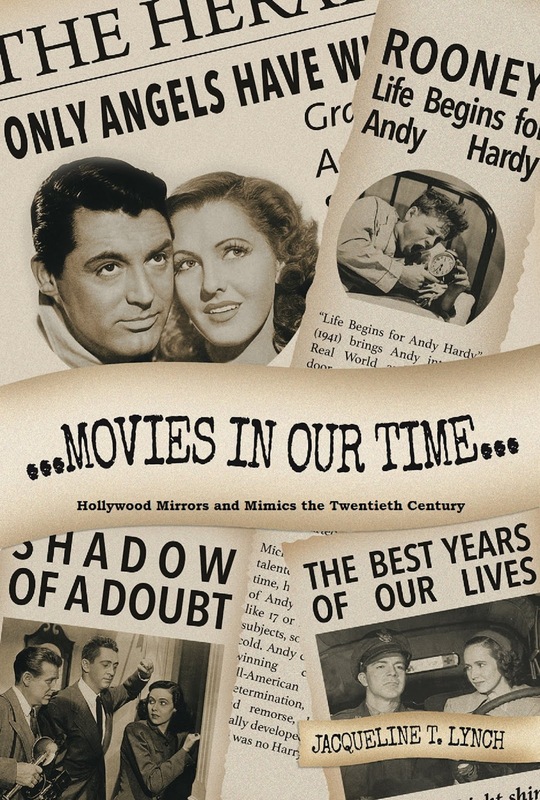 Neither Alan Ladd nor Veronica Lake may be ready for a relationship at this time but unlike most film noir movies, this movie ends with the hope of a new life of something better. Much has been written about Lake’s and Ladd's screen partnership and I actually preferred them in other roles in other movies. I think Veronica Lake was brilliant in Sullivan's Travels (1941) and in I Married a Witch (1942), discussed here, and So Proudly We Hail (1943) here. I think Alan Ladd was brilliant in Shane (1951), discussed here. I don't think they reached their full potential with each other. I wouldn't say they were a case of being mismatched, it isn't that. They were interesting to watch as a pair but I think the reticence their characters showed each other in this movie is something of a metaphor for their ability to connect with each other as actors. Their meetings were always intriguing, their goodbyes were less than dramatic. Film noir had a way of making the main characters somehow distant and inaccessible and mystery was part of the genre. We weren't really supposed to know them that well. They weren't supposed to be people with whom we could feel entirely comfortable. Alan Ladd, with all his ambivalence and aloofness came to be well-known as a film noir hero. Like the character he plays in this movie, Ladd was more or less thrown into it and stuck with it and he had to endure it until something else came along. The most burdened person, and most unexplained and therefore mysterious, in The Blue Dahlia, for my money, is Hugh Beaumont. There should have been a Veronica Lake for him. 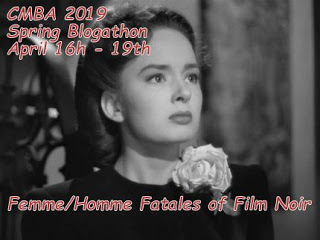 Be sure to check out the other terrific blogs and their entries in the Classic Movie Blog Association blogathon: Femme/Homme Fatales of Film Noir. "If I have offended you by this rather mild account of Buchenwald, I am not in the least sorry." On April 15, 1945, journalist Edward R. Murrow entered the Buchenwald concentration camp with the American Army and broadcast what he saw. In this disgusting era of attacks on journalism and journalists, and the appalling ignorance of the facts of the Holocaust, and the evil of its deniers, it is imperative to speak the truth, to hammer the truth home to those who are too lazy, too stupid, or too corrupt in their hearts to want to listen. Listen as well to what people said to him about President Franklin Delano Roosevelt, who died only a few days earlier on the 12th. Listen to when the world recognized moral American leadership and was grateful, in an era when we realized the democracies of the world were our friends and we knew we couldn't do it without them. I am inclined to think fans of classic films have a better grounding in the study of history than those who do not watch classic films, but I really don't know that for a fact. I do know that those fans of classic films who indulge only in the fantasy aspects will deny themselves the greater value, and the greater privilege, of learning about the sometimes hard and gritty bedrock of the world in which those films were made. This month marks the 12th anniversary of Another Old Movie Blog, and, having passed over 2 million pageviews, I'm grateful take this opportunity to once again thank you for the pleasure of your company. The Search for Bridey Murphy (1956) created a 1950s fad and fascination with reincarnation, spawning books, records, jokes, and “come as you were” parties. 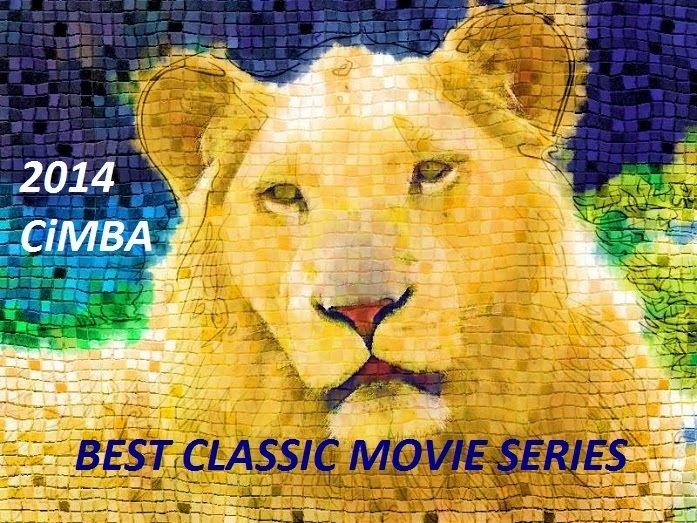 It is based on a true story, and its docudrama presentation is used to grab the audience in a way more effective than if the subject were sensationalized. Pop culture in later decades churned out almost an entire industry around unexplained phenomena, and this movie, which did not really stand the test of time despite the huge splash it made, explored taboo fears in an unsettled postwar world. The story is based on the book of the same name, published in the same year, by Morey Bernstein. He was a businessman who developed a fascination with hypnotism. It became something of a hobby and something of a parlor game. 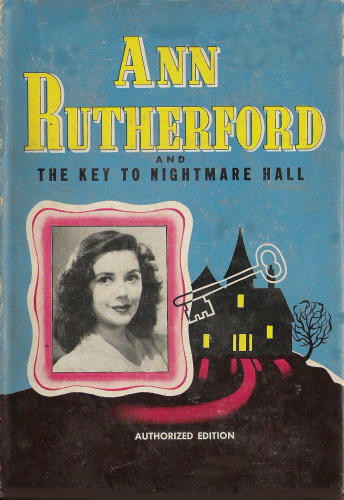 On one such occasion he hypnotized a Colorado housewife named Virginia Tighe (to protect her identity in his book and in the movie, she is called Ruth Simmons). Through hypnosis, he took her back in time to her childhood and as an entertaining experiment, tried to see how far back in her conscious he could take her. Unexpectedly, she began to speak of memories of her experiences in the previous century in Ireland, and she spoke with an Irish accent. She identified herself Bridey Murphy, who lived from the late 1700s through the early 1800s. In several hypnotic sessions with him, she told of experiences of her childhood in Ireland, her marriage, and even her death. Bernstein and their circle of friends were astounded. They had stumbled upon, so it seemed, evidence of a case of reincarnation. Bernstein wrote a book about their sessions and it became a bestseller and spawned a great deal of talk, speculation, and fascination with her story. But since neither were after fame or notoriety, Virginia Tighe preferred to live her life out of the spotlight, for the most part, and Bernstein gave up hypnotism and went back to his business. They both died a few years apart from each other in the 1990s. The movie is amazingly powerful despite its low-key simplicity. 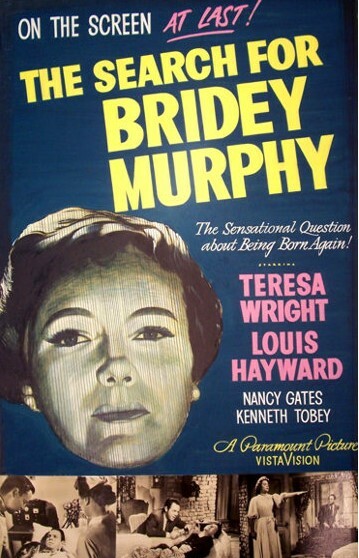 Teresa Wright stars as Ruth Simmons, the woman who appears to have reconnected with her reincarnated self, Bridey Murphy. 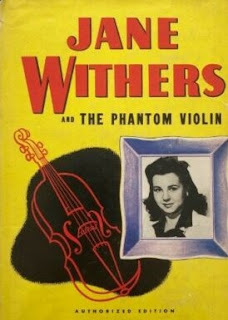 This would not be Miss Wright’s final film but it would be her last leading role. She was now in an era where Hollywood tended to turn away from its big female stars once they had reached their 30s and a new crop of younger nubile actresses came along. But I suspect the role itself appealed her and was a different sort of challenge than she had had in other films in her career. She actually spends most of the movie lying on a couch with her eyes closed, but despite the lack of movement, she is in close-up most of the time and we are riveted to her changing expressions and to the soft lilt of her Irish accent. She acts out responses to Bernstein’s questions, at turns haughty, dismissive, irritated, delighted all while being under the haze-like influence of hypnosis. On one occasion, she is asked to do a jig she has described and she stands and performs a graceful Irish dance. Unlike in most stunts that hypnotists ask their subjects to perform, she does not look silly. The quiet moment leaves the viewer somewhat awestruck and Bridey Murphy becomes not a joke or a parlor game but an eerie unknown which is equal parts intriguing and somewhat frightening. 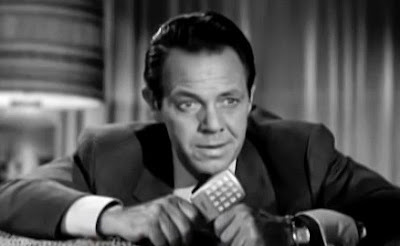 Louis Hayward plays Morey Bernstein in this movie. We last saw him as Philip Lombard here in And ThenThere Were None (1945). Hayward and the other members of a rather large cast are really actors and actresses with minor careers and after this movie invariably did a great deal of television. Richard Anderson, who plays a doctor, is among them. He probably had a more prominent career than anyone else of the supporting players. Using a cast of predominantly little-known players in a documentary format gives the movie a certain quiet, sober feel that perhaps producers felt added to its authenticity. It allows us to take the subject more seriously than if it were an overblown soap opera plot with a cast of stars. The movie opens with Louis Hayward standing behind flats on a movie set. He breaks the fourth wall and speaks directly to the audience, describing to them what is about to happen. Suddenly, he walks onto the living room set and starts speaking as if the action has started and he is Morey Bernstein. It’s an interesting effect that seems seamless, like the drifting between past and the present in this movie, like the swing from conscious to unconscious, he moves from reality to make believe in an instant and it is kind of a metaphor for what is about to happen. He is a businessman invited to the home of some friends where he sees a man attempting to hypnotize the lady of the house. It is all in fun and like any nightclub hypnotist of the day, he gets her to do silly things and the other guests at the party laugh. Bernstein thinks it’s all nonsense and he volunteers to be hypnotized but it doesn’t work on him. The doctor, played by Richard Anderson, tells them that not everyone can be hypnotized and this intrigues Bernstein. He learns as much about hypnotism as he can, starts trying it out on other people and finds he has a knack for it. He even helps Richard Anderson in his clinic for people who suffer from disability. Bernstein’s own skepticism tumbles away when he sees that he is able to help people walk, or take away migraine headaches purely by hypnosis. He practices on his own wife and it gives him the courage to practice on other people. At another house party, a guest talks about another famous case of hypnosis used in medicine by renown clairvoyant Edgar Cayce, who was called The Sleeping Prophet. Cayce had died the previous decade and had become famous for his ability under a hypnotic trance to diagnose the illnesses of people and to describe how they should find a cure. Also, to the Cayce story is the aspect of reincarnation. When we are told about Edgar Cayce, we are given a flashback scene acting out a very eerie instance where Cayce describes an old-time remedy that even the druggist doesn’t know he still has on his shelf that cures a boy’s leg. Bernstein is so fascinated, he travels to Virginia Beach, Virginia, to meet Cayce’s son Hugh who runs the Edgar Cayce research center. He comes to believe that Cayce was not a fraud. Bernstein still doesn’t believe in reincarnation but he’s very interested in seeing if he can take a person back in time through their subconscious to as far as childhood. At another party, Teresa Wright, with her husband’s permission, volunteers to be the next guinea pig. Her husband is played by Kenneth Tobey, stalwart, solid, middle management 1950s suburban dad who is freaked out by all of this and wishes she would just stop, but he is indulgent and allows her to play the game. Bernstein hypnotizes her and takes her back to events that happened when she was seven years old. It’s quite convincing. A couple of days later they pick up the session and he takes her back to one-year-old and he audiotapes her conversation with him. 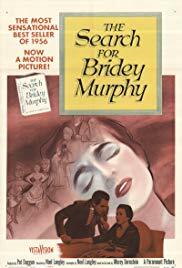 Through successive sessions he tries to take her back farther and farther –suddenly we tap into…Bridey Murphy. Bridey Murphy is four years old and she lives in Cork, Ireland, and Teresa Wright speaks in Bridey’s Irish accent. She is eight years old. She is 15 years old. She is 18 years old in the year 1806. She talks of her family and her childhood experiences with her parents and siblings. The flashbacks occur in a foggy haze with other actresses playing Bridey and her circle. Teresa Wright sings a brief little song a cappella and it is sweet and it is eerie. Her husband is annoyed, and Bernstein’s wife, played by Nancy Gates, is also a little jealous of their time together. 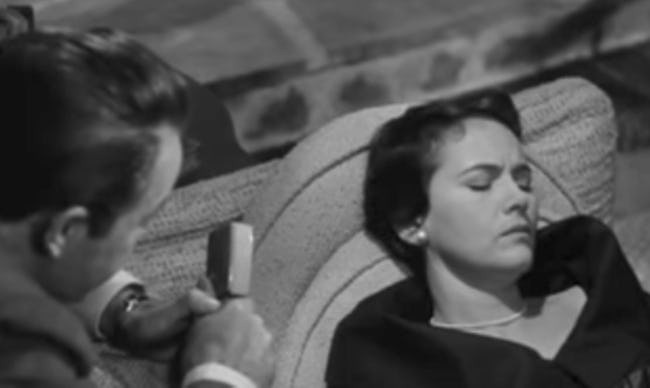 Teresa Wright lies supine, serene under a blanket, her pearl choker nestled against her neck. 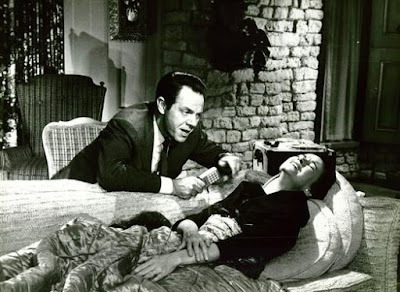 She is utterly helpless in the hands, psychologically, of Louis Hayward. We learn about Bridey's life, of her parents, how she married at 20 and lived with her husband in Belfast and had no children. She describes many aspects of what it was like to live in Ireland at that time. Her husband puts his foot down once again to stop. There is a religious debate with a priest and a minister. The priest, when challenged by the concept of reincarnation as the basis of the Buddhist faith replies, “Any sincere faith manifests its strength by its tolerance of other faiths.” These are noble words to live by and they have a philosophical discussion. 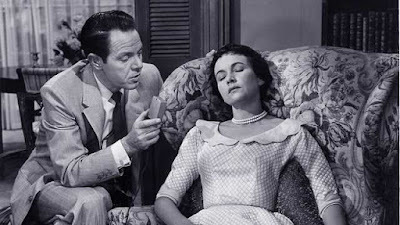 At first, Teresa Wright is freaked out by the notion that there is someone else living in her psychic memory, but now she is curious and her husband lets her go ahead. Richard Anderson hovers by, also concerned about some unseen danger that we don’t know. Professors and a publisher take note. Then we have the death of Bridey Murphy, which is, after all, the point on which reincarnation hinges. A person cannot be reborn unless they first die. Bridey is 66 years old and she breaks a hip. She lingers in bed while her husband takes care of her. He goes to church (there is some discussion of their religions because he is Catholic and she is Protestant) and she has died while he is gone and he was very upset to have not been with her at her death. These are really sad and haunting scenes. Hallene Hill plays Bridey at 66. She had a career of minor roles usually “old lady.” She, like all the other cast members in the flashback scenes, does not speak. There is only pantomime with Teresa Wright’s narration over what they are doing and saying. 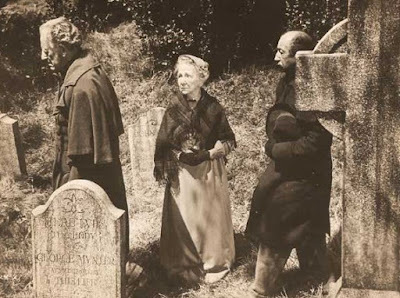 When Bridey dies, Hallene Hill, ghostlike, sees her own funeral, her own burial plot at the graveyard, and Teresa Wright reads the stone. The ghost of Bridey hovers in her own home to watch her grieving husband and is sad that she cannot reach him, he does not hear her, he does not know she is there. She visits the home of her brother but he does not see or hear her either, and she spends a lonely existence in an afterlife. And then Teresa Wright says she is born yet again in America, another person. Their session stops only after Bridey seems to not want to let go. Bernstein tries to awaken her from her hypnotic sleep but every time he does, gives her the command to wake up, she's still Bridey. Bernstein panics, her husband panics, everyone in the room panics as, time and time, again he orders her to be Mrs. Ruth Simmons but Bridey won’t let go. It is a sedate and quiet moment in the living room but it is more frightening than any monster movie you’ve ever seen. She keeps speaking in that accent, running over and over again on a frantic loop, her memories as Bridey Murphy. At last, finally, Ruth breaks through and comes back. The doc says this has to stop. Bernstein is only too happy to stop now; he’s ready to have a nervous breakdown. A publisher has become interested in the book and the wheels are in motion to print Bernstein’s audio transcripts of his sessions with Teresa Wright. First, however, they must do some checking to see if they can verify the facts as they have come to know them about Bridey Murphy. William J. Barker, who first wrote of the sessions in a series for the Denver Post, plays himself in this movie, and co-wrote the book. But under the glaring light of celebrity, this is where the fancy crumbles; not in the movie, but in real life. In the aftermath of the book’s popularity, facts from the transcripts were investigated and it was difficult to find evidence of a Bridey Murphy living in the place and time that was described. Some aspects of her stories were proven but others could not be substantiated. 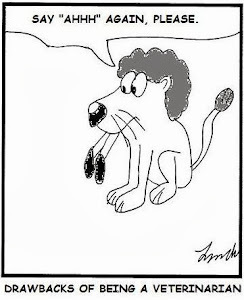 In some circles, the debate continues to this day. It was discovered that the real Ruth Simmons,/Virginia Tighe, had at least one aunt and also a neighbor, who came from Ireland whom she knew as a very small child and she could have been repeating memories they told her. There were some accusations of this all being a hoax. However, scientists and psychologists have decided that this really was a case of cryptomnesia, rather than a paranormal experience or a hoax. It was really an equally fascinating aspect of our subconscious that allowed her to remember stories told her from her earliest childhood, that she had forgotten, and that she had subconsciously borrowed. Something had been planted in her memory and she could not control it but lived it through hypnosis as if it had been her own experience. However, the mournful scenes of a ghostly Bridey Murphy watching her grieving family from beyond are of some of the most powerful in this movie and they don’t seem to be explained by the researchers, so I’m not sure if this was something the writers of the movie threw in, because I have not read the book. Maybe someone can set us straight with an explanation for that. The Search for Bridey Murphy is a piece locked in time—in the 1950s, not necessarily in 1800s Ireland, where existential worlds collided and the sane normal was shattered in the mundane and iconic 1950s suburban living room. It is a movie probably forgotten these days, but it is well worth a look for its interesting avenue of storytelling and for Teresa Wright’s ethereal performance. Currently, you can see it on YouTube. 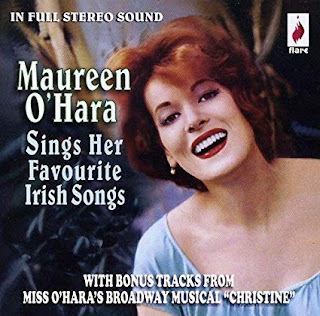 Maureen O'Hara appears on page 49 of Big Star Album, no. 1, Winter 1943, a large magazine from the Dell Publishing Company. 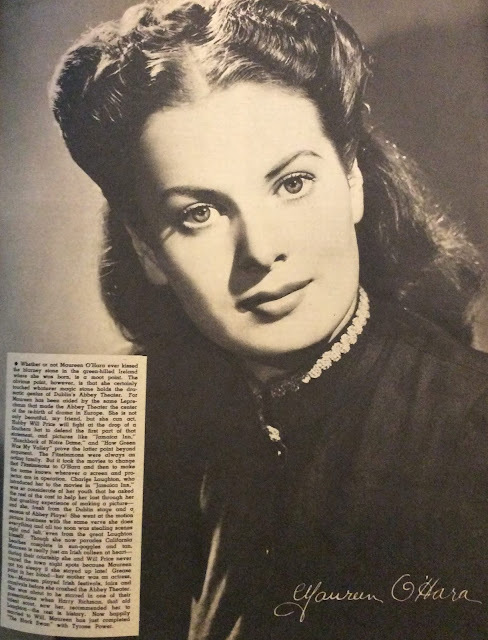 The paper is not glossy, being the wartime stock, but the issue is loaded with full-page portraits of the stars of the day. 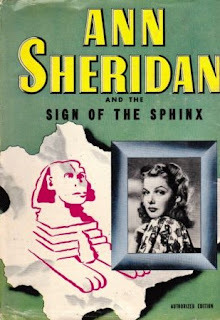 One is struck by the repeated references to Miss O'Hara's Irish birth, not as a matter of biography but rather, it seems inferenced, as a selling point, an important part of her studio publicity. To have been foreign born is naturally exotic to us, and to have trained in Dublin's illustrious Abbey Theater is certainly impressive, but her blurb is filled with Blarney Stone and leprechaun references, of being an Irish colleen. Did Marlene Dietrich's German heritage, Ingrid Bergman's Swedish heritage, or Greer Garson's English heritage matter as much to their careers? Were they selling points, or merely interesting trivia? The article stresses that despite her beauty, Miss O'Hara was an accomplished actress, that she was not just building a career on her charm. Indeed, she was a splendid actress, nor did she lean on predominantly Irish roles, which would have limited her career, though she was obviously proud of her ancestry and even recorded an album of Irish folk songs. Even charming tropes are still tropes, and one must wonder if they weren't occasionally an exhausting burden. 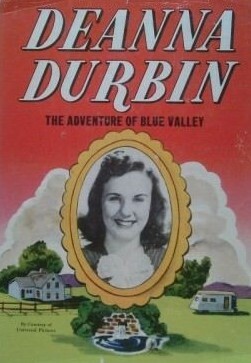 Deanna Durbin had a secret life, at least as evidenced by her two adventures told in children's novels: Deanna Durbin and the Adventure of Blue Valley, and Deanna Durbin and the Feather of Flame. These began a popular, if sometimes rather odd, series of girls' books by Whitman Publishing Company of Racine, Wisconsin. We learned about the adventures of other stars as well in exploits never told in fan magazines. These two books were published in 1941 and spearheaded the collection that would be known as the Whitman Authorized Editions, though whether any star actually authorized these stories is quite doubtful. They do stand as creative examples of not only the studios' ownership of its stars, but its wide-reaching commercial exploitation of the stars as its products. 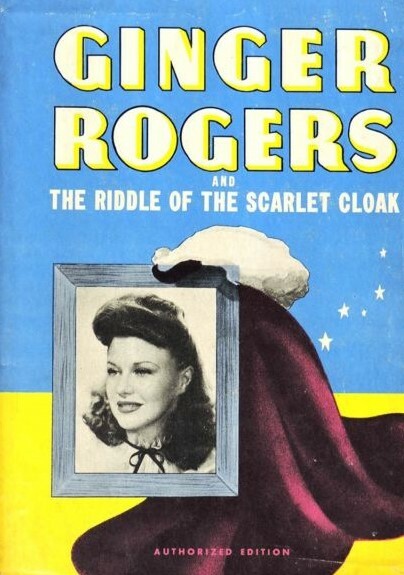 One of the more interesting of the series was Ginger Rogers and the Riddle of the Scarlet Cloak, which was actually written by her mother, Lela E. Rogers, so Ginger must have at least known about the novel even if she didn't authorize it. 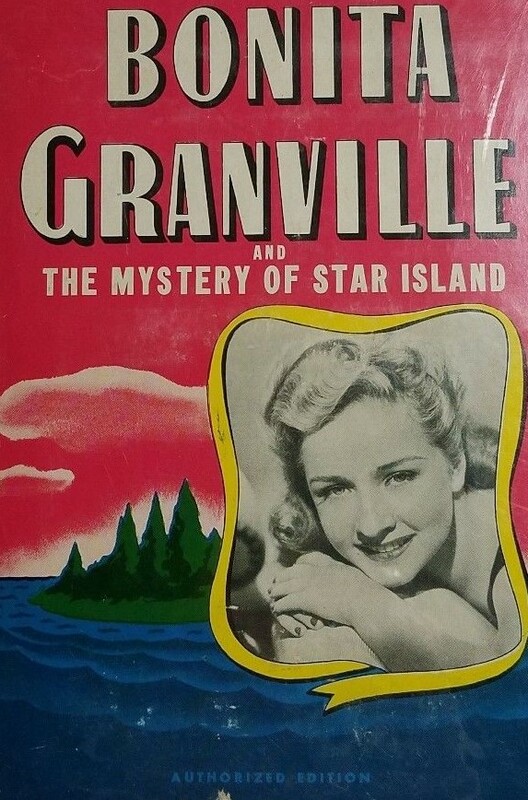 The story has Ginger dealing with a rough relationship with her mother, meeting her father for the first time, and in her job as a night switchboard operator for a hotel, ferrets out enemy spies in the aftermath of Pearl Harbor. A full day's work. Most, but not all, of the books in the series were written by Katheryn Heisenfelt. Shirley Temple and the Screaming Specter (because why should Jane Withers have all the excitement? Van Johnson, the Luckiest Guy in the World. If any of you have read any of these books, I'd like to hear your book report. In this previous post from 2010, I discussed some children's novels that were centered around World War II and published in that era. I'll be writing a book on this subject, something that's been on the back burner for, obviously, a very long time. My to-do list is so long it sometimes strangles me, and I have to shoot it. But I'd like hear your input as well on books like the Cherry Ames series, the Dave Dawson series, the Ann Bartlett series, etc., all the pre-teen novels about the war. I'll post more on this down the road.